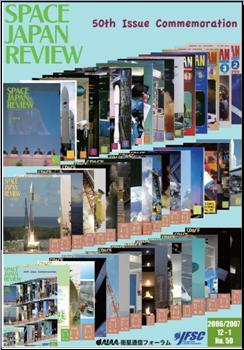 This issue of Space Japan Review (SJR), which was a bulletin of AIAA-JFSC (Japan Forum on Satellite Communications), is the commemorative 50th one since its first issue was published in 1999. Its history is looked back briefly in the following. I want to add my warm congratulations to the Japan Forum on Satellite Communications for the 50th addition of its Space Japan Review (SJR). I have always enjoyed reading and contributing to the SJR, and especially appreciated the excellent interviews of top satellite executives. This article describes how the satellite communications technology should foresee the future in the Web 2.0 era and how AIAA-JFSC (Japan Forum on Satellite Communications) activity should be related it. The Web 2.0 is new movement, and it is necessary for us to pay attention to it form a point of view whether a change would be occurred equal to the Industrial Revolution revolutionizing a form of social business. AIAA system exhibition was grandly executed in MWE2006 (It was done according to APMC06 held once every four years in Japan this year) that had been held in Pacifico Yokohama from 13th to 15th in December, 2006. Throughout the procurement task, I always respected the patience by the project people. And that patience influenced me. The important lesson I learned from them was that it is most important to be engaged in the task closely without giving up easily.